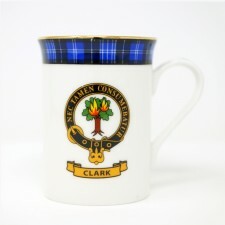 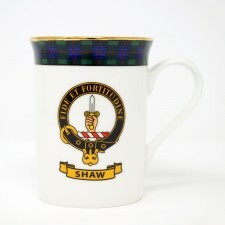 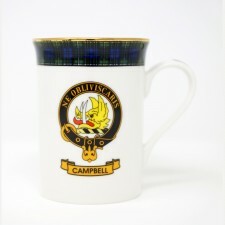 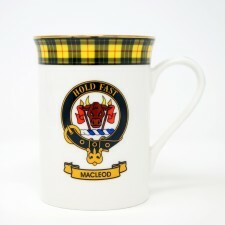 These family crest bone china mugs are available in a wide choice of ~90 different Scottish clans and sects. Each one would make a much-appreciated gift and beloved reminder of an individual's Scottish heritage - all while enjoying their favourite hot drink. Choose from a fantastic range of Scottish clan crest mugs from Gretna Green - perfect little extra gifts or enjoying your favourite drink while showing your clan crest and tartan. 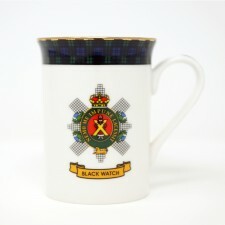 Each of these fine bone china mugs features the family crests and mottos of over 80 different clans and septs. Find your Scottish clan name, history and heritage here today. Each bone china mug is decorated in Scotland and incorporates a band of the clan tartan around the top and is finished with the clan crest in the centre of each. Flashes of your clan tartan accent the full colour crest of your clan. These bone china mugs are built to last and are dishwasher safe.